When it comes to kid-friendly frights, autumnal adventures, and holiday events the whole family can enjoy, every corner of Columbus, Ohio, comes alive in October to celebrate Halloween with pumpkin patches, hay rides, and haunted houses appropriate for all ages all across the region. For safety reasons, it's important to note that many of these events discourage adults from wearing costumes that cover their faces. Although you can feel free to dress up, you'll need to leave masks at home to avoid scaring children unintentionally or causing unnecessary concern in general. While there are also plenty of adult Halloween events and activities in Columbus as well, all of the following are appropriate for children of all ages unless specifically noted otherwise. If you're unsure if an attraction or event is right for your child, you can call the company producing the event or visit its associated website for more details. An annual favorite for many Columbus families, you can kick off the season at the Fall Harvest Jamboree on Saturday, September 29, 2018, from noon to 5 p.m. Kids get a pumpkin to take home (while supplies last) and can play in the corn maze or enjoy other fun games and activities on the farm. You can also try out the rock climbing wall or take a horseback ride as well for an additional fee. The Jamboree is located on Smiths Farm at 3285 Watkins Road in Columbus and is free to attend, but parking will cost you $5. Creekside Park and Plaza in Gahanna, Ohio, (117 Mill Street), will host the annual family-friendly Creepside Festival on October 27, 2018, which features all sorts of activities, games, and prizes. Live music, Pokemon Go battles, firemen meet and greets, a mad science lab, and a "not-so-scary trail" are just some of the fun things you'll find at Creepside, which is free to attend. However, you should plan to get there early so you have plenty of time to take it all in as the event only last from 1 to 5 p.m.
An old-fashioned Halloween awaits at the historic Ohio Village on the second and third Saturdays in October. 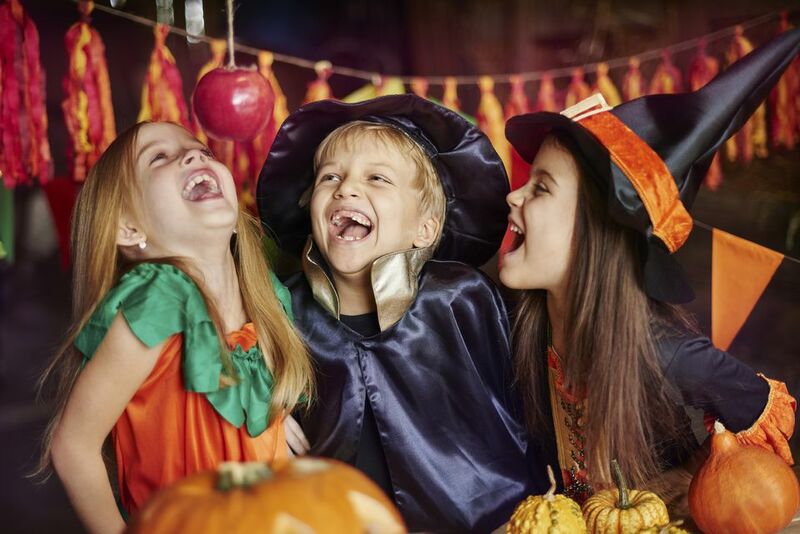 Your kids will get a taste of 1890s-style fun hearing a retelling of Washington Irving's classic tale "The Legend of Sleepy Hollow" by the bonfire, and they can also find pumpkin carving, old-timey games, and antique crafts throughout the evening. Events take place from 5:30 to 9:30 p.m. each Saturday at the Ohio Village at the Ohio Visitor Center in Columbus (800 East 17th Avenue). On the last two weekends of October in 2019, the Creepside Festival will welcome guests to its annual Boo at the Zoo event, which will be presented by MIST TWST this year. Friday from 5 to 9 p.m. and Saturday and Sunday from 10 a.m. to 8 p.m., you can go to the zoo and get some free candy, too! Fun adventures await your costumed kids as they explore the Columbus Zoo like never before. Candy stations will be scattered throughout the attraction, and the staff will all be dressed up for a "merry-not-scary" good time. Be sure to catch the animals do their pumpkin smashing, a highlight of the event each year. If you're traveling with your four-legged furry family members (not your annoying little cousin, your dog! ), there's even an event for your pet. You can dress them up and join the annual Pet Parade and Fall Festival at Easton Town Center's Fenlon Square in Columbus on October 21, 2019, from noon to 3 p.m. Prizes are awarded for the best costumes, including "Best Group" and "Best Duo," so make sure you and your puppy are both ready for the fun. Homemade dog treats, caricature artists, and more fun activities await you, your pets, and your kids at this annual event, so be sure you don't miss out. Spend a Sunday afternoon at North Market (59 Spruce Street) for some simple Halloween fun on the last weekend of October this year. This family-friend event is free to attend and your kids will have a blast with music, crafts, and, of course, trick-or-treating. Additionally, Sunshine Farms will have a petting zoo open from 11 a.m. to 2 p.m. and Sparrowznest will be painting faces all afternoon. A stage full of costumed singers and musicians sounds like a fantastic way to kick off Halloween weekend, and Ohio State University (OSU) music students put on quite the show in this annual concert. Held on Friday, October 26, 2018, from 8 to 9:30 p.m. at the Weigel Hall Auditorium on the OSU campus (1866 North College Road), this event is fun for the entire family. Dress up or don't, you'll have a great time either way.